Pope John Paul ll will be made a saint by the end of the year after a commission of Catholic cardinals approved a second miracle.The first miracle was the healing of a severely ill woman from Costa Rica on the very day John Paul ll was Beatified. Catholic Church has three steps to sainthood. First, the person concerned has led an exemplary life. The final stage is canonization that requires at least one more miracle. One example of a miracle that could be attributed to the Polish-born priest is the inspiration he gave to young Filipino men and women to enter the seminary and convent, respectively. A young man who attended the World Youth Day in 1995 was so inspired (of the Pope) and now he is a priest. Many people entered the convent and the seminary because of the positive influence of the Pope. Again, in themselves they are concrete proofs that JP is truly a Saint (which could be added to Beatification requirements). 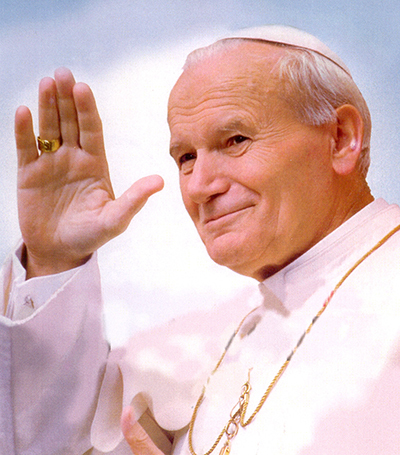 This entry was posted in Inspirational and tagged beatification, Beatification of Pope John Paul II, canonization, Catholic Church three steps to sainthood, exemplary life, miracle, Pope John Paul II, Three steps to sainthood on July 12, 2013 by Yami.